Why Should We Plant Natives? 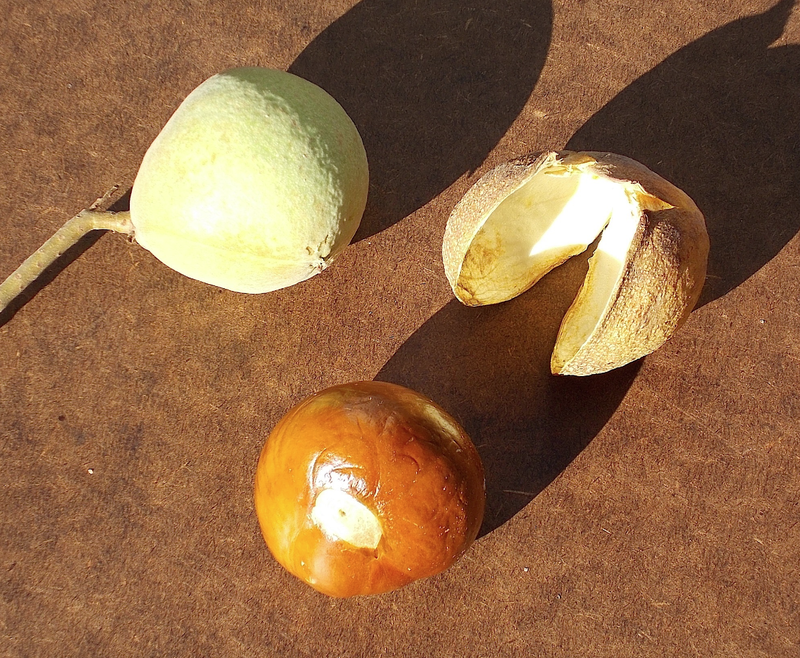 For Beauty and Color For many years, Jeff’s mother felt that native California plants just wouldn’t look right in her garden in Orange County, California. 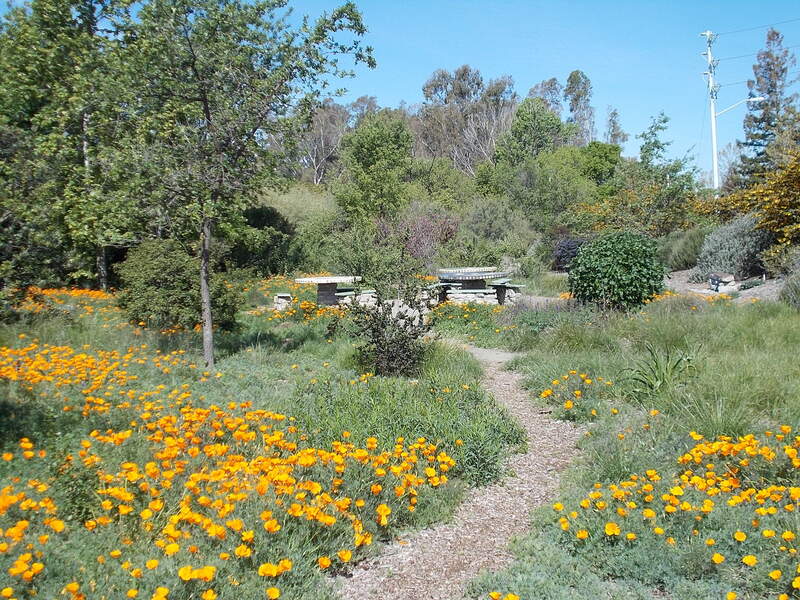 She had planted a lush non-native landscape to remind her of her Pennsylvania childhood, and she resisted incorporating even one California native. 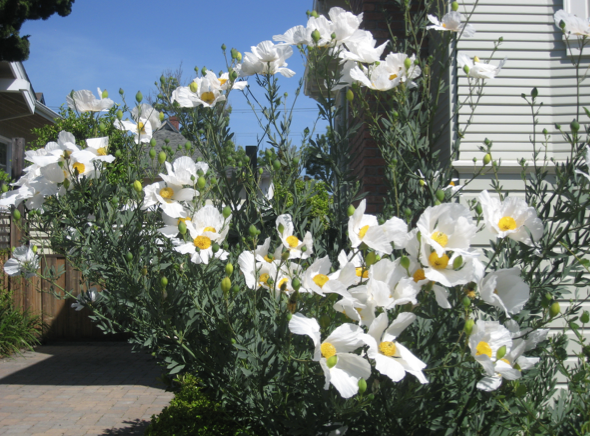 Then, she discovered the Matilija poppy, and her resistance evaporated. Now, Jeff’s mother takes joy in the Verbena lilacina, Penstemon Margarita BOP and Ceanothus ‘Ray Hartman’ which showplace in her garden. She delights in the gulf fritillary and monarch butterflies that sip nectar from her flowers and lay eggs in her garden – things she had never noticed before. Goldfinches feed the caterpillars to their young and feast on the seeds produced by her now-California garden. This is the kind of paradigm change that needs to happen in our California gardens and yards. Small changes in many yards will make a big psychological impact. 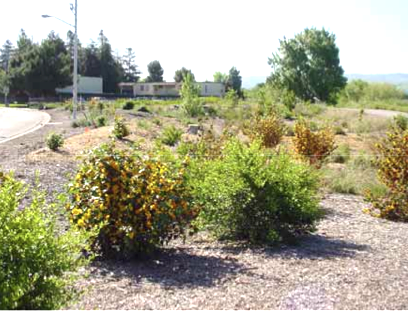 Environmental Compatibility Native plants have evolved to live within the local climate, soil types and water supply. Simply stated, native plants grow well in the climate in which they have evolved – better than those that evolved in Asia or South Africa. 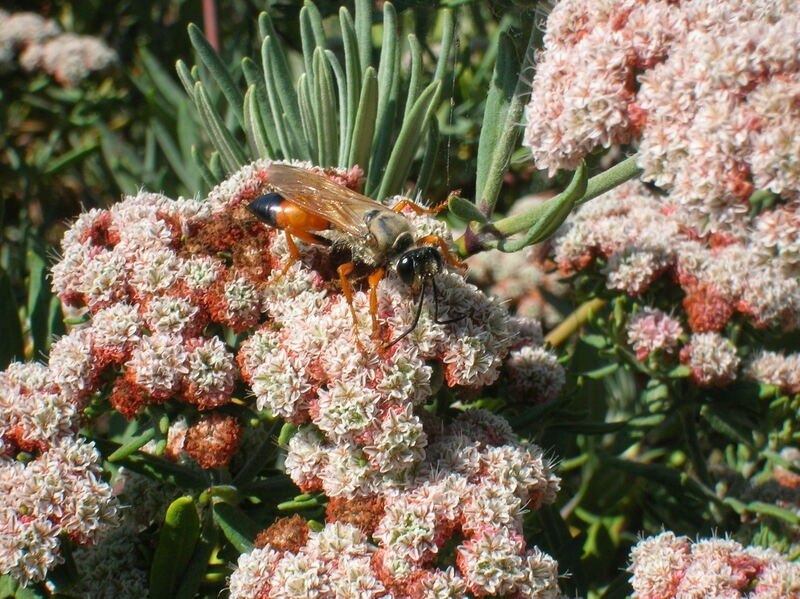 Furthermore, native bees, butterflies, birds and other animals have co-evolved with the same native plants, so that both native plants and native animals depend on one another for food, shelter and reproductive success. When one part of this collage disappears, the rest of it is irretrievably affected. Resistance to Pests Because native plants have evolved alongside native pest organisms, they have developed resistances to the pests and are less likely to be affected by them. The loss of native plants in the environment, and their replacement by plants that have evolved in a different environment, disrupts this natural balance between plants and animals. Plants that have the potential to become invasive, and animals that can turn into pests, no longer have the natural controls that keep their populations in check. A golden digger wasp – great for pest control! As a result, humans resort to artifi- cial herbicides and pesticides which further degrade the environment, get into our bodies, and kill off both the pests and the beneficial insects as well. The re-introduction of more native plants can help restore the balance between native plants and animals. 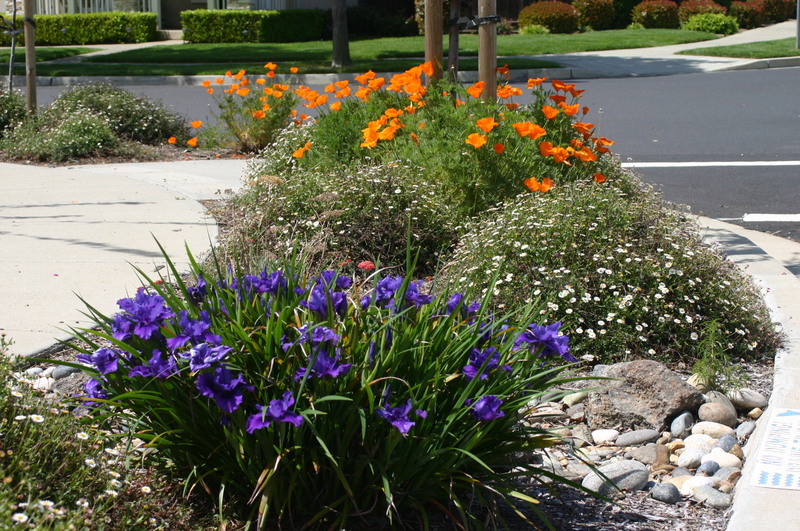 Native irises, Santa Barbara daisies, and California poppies in Cindy’s garden. 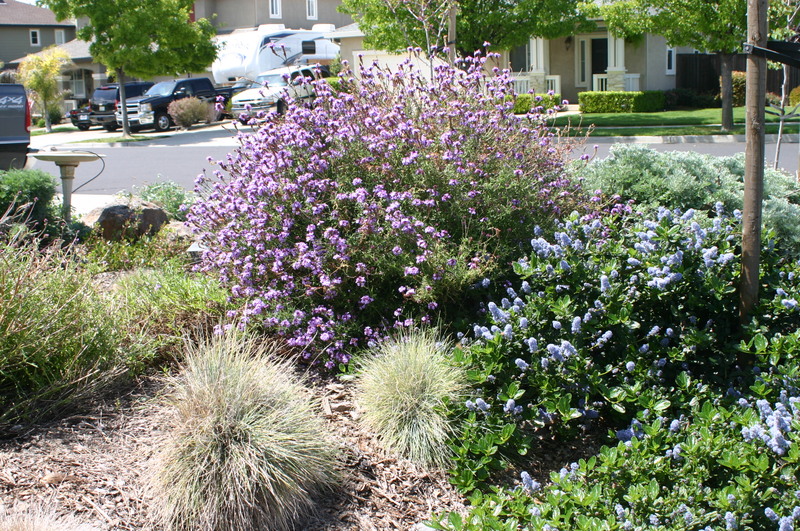 Minimal Maintenance Expense California native plants have evolved to thrive in the heavy, dry, clay and gravelly soils that characterize the Livermore-Amador Valley. 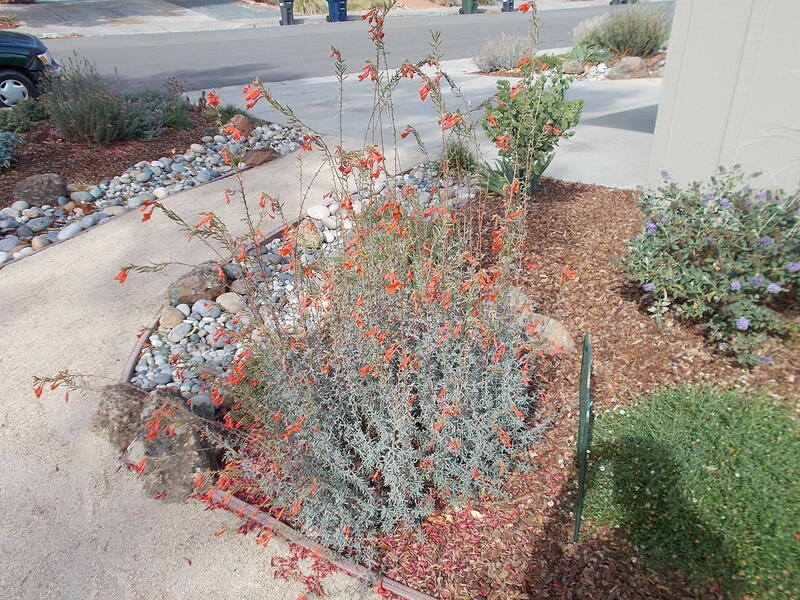 If properly selected and sited, native plants should flourish with a minimum of attention. Fertilizing, spraying and pruning can be reduced or eliminated – a healthy layer of mulch provides as much slow-release fertilizer as the natives require. Appropriate strategies help create a self-maintaining ecosystem that will attract in beneficial bugs to out-compete and devour the unwelcome ones. Occasional pruning, shaping and dead-heading, which is routine with any landscape or garden, is all that is needed. Lilac verbena, California lilac and Idaho fescue in Cindy’s garden. Habitat Preservation Non-native plants often mean trouble for natives. They might simply be more competitive than native species for nutrients, light, space, water or food. 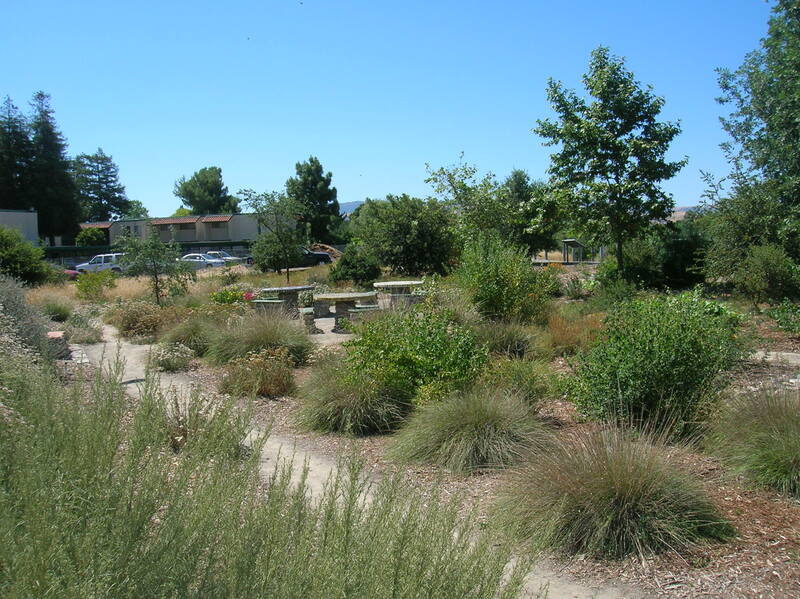 At the Granada Native Garden, the first winter rains produce fast-growing non-native grasses and weeds that smother the natives which are just emerging, unless our volunteers aggressively evict the weeds as they appear. If a non-native species has evolved to survive competition from other plants or from predation, it might have no competition in its new environment. Some non-native weeds produce chemicals that inhibit the growth of other plants in the same vicinity. The root systems of some species might enable them to reach water unavailable to the surrounding natives, thus crowding out the natives. Others are better able to resist fire and to recover after frequent, intense fires. The invasive species eventually grows larger and denser as it adapts to its new location, thus displacing the natives. Furthermore, the loss of native species results in the decline of native birds and insects that have evolved to rely on these plants. It is happening all over the world. Hummingbird fuchsia greets visitors in Kerry’s garden. Attracting Wildlife Birds and pollinators are essentials, not luxuries. Birds provide natural pest control, watershed protection and re-forestation services. And the Audubon Society says that the best way to attract birds is to plant natives. 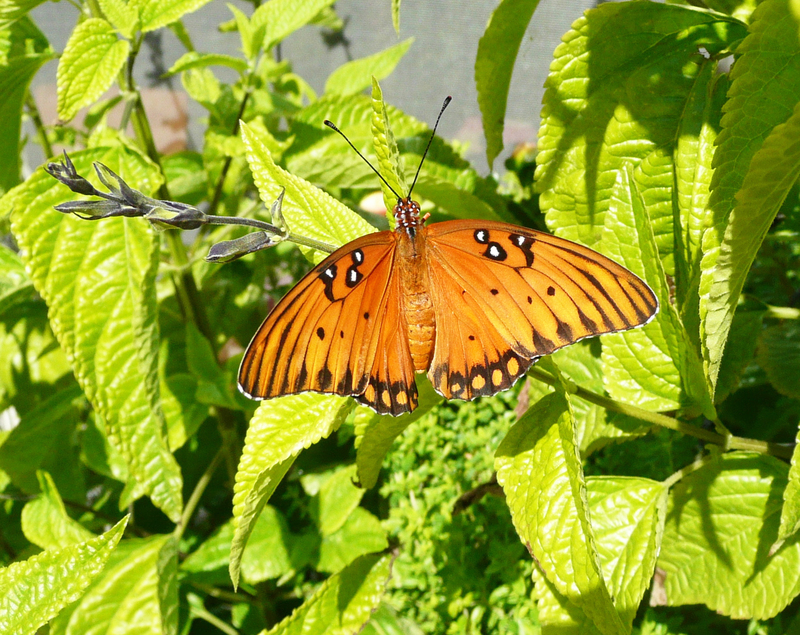 A gulf fritillary butterfly in Jim’s garden. A mama California quail and her children, out for a stroll. Almost everything growing at the Granada Native Garden was useful to the indigenous people in one way or another. Many of the plant identification markers at the Granada Native Garden include notes about the historical uses of native plants. Check them out! Well done Jim, enjoyed the articles and pictures. I learned so much just from reading this one article. Thank you for all the research you did to write this! One of your best articles yet. The article is so interesting and informative! I learned so much! Thanks! You are welcome. I appreciate getting feedback; you are apparently the first reader from another continent! I hope you will find our previous, archived articles similarly interesting and informative. 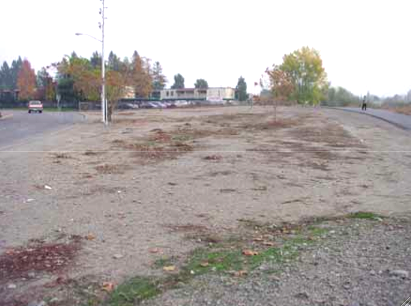 Can someone please contact me about using high resolution photos from your site for a demonstration garden exhibit at the Gateway Emergency Preparedness Exhibit Center in Oakland? You may email me at JIMatGNG@gmail.com about what you are looking for.